If you are digging up lots of Montbretia or Watsonia corms, please don’t throw them in the bin or the compost. You could smash them up with a hammer or try this drying/baking method! Corms need to be dried out or ‘baked’ to kill them. Once dried, they can be used as fire starters or will break down to almost nothing to put on the garden. Keep them out of the regular compost as best you can, because the wet and warm compost provides perfect growing conditions. If some get caught up and start growing in your compost it is easy enough just to pull them out and put them in your drying/baking system. 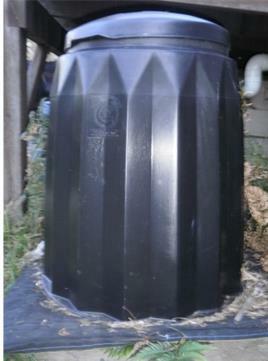 Get a black plastic compost bin from council or hardware. Locate the bin in a place that gets good northern sun all year round. Sit it up off the ground, on a stand covered in mesh to allow the air to flow – eg steel mesh covered in metal fly screen, or something else that will stop the corms falling through, and still allow air to circulate. Put your corms in the bin and they will break down to a dry ash like material.